Alaska Dispatch News, Dec 11, 2014 (emphasis added): Polar bears in the southern Beaufort Sea area are suffering hair loss due to a condition called alopecia syndrome… but the precise cause of that stress is yet to be determined, according to a new study… in the Journal of Wildlife Diseases… Over the study period, 3.45 percent of the bears examined had alopecia syndrome — [loss of] hairs around the head, neck and shoulders, accompanied by crusty lesions on the exposed skin. The incidences peaked in 2012, when 28 percent of the examined polar bears had the problem [when] a mysterious affliction, with patchy fur loss and bleeding skin lesions, sickened hundreds of Arctic Alaska seals, killing many of them. The affliction was seen among some walruses… There were some years when none of the captured polar bears had alopecia syndrome, and some years, like 2012, with relatively high rates… “They might be more energetically stressed, and then they encounter some other stressors,” [USGS biologist Todd Atwood] said. 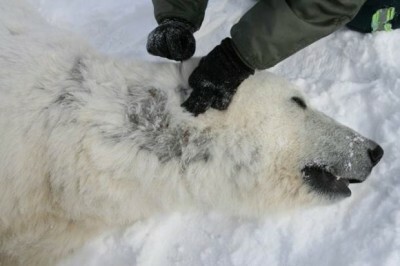 Journal of Wildlife Diseases, scientists from USGS and Alaska Department of Fish & Game, Jan 2015: Alopecia (hair loss) has been observed in several marine mammal species… From 1998 to 2012, we observed an alopecia syndrome in polar bears from the southern Beaufort Sea of Alaska that presented as bilaterally asymmetrical loss of guard hairs and thinning of the undercoat around the head, neck, and shoulders, which, in severe cases, was accompanied byexudation and crusted skin lesions. Alopecia was observed in 49 (3.45%) of the bears sampled during 1,421 captures [peaking in] 2012 (28%)… The cause of the syndrome remains unknown and future work should focus on identifying the causative agent and potential effects on population vital rates. 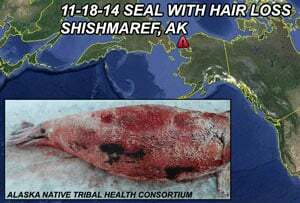 Seal with hair loss – Shishmaref, AK, Nov 18, 2014: A [bearded seal] had fur missing from its back, flippers and stomach… There has been a disease of some kind that killed many ice seals and bearded seals in the region… when we see this it makes us nervous… sealscontinue to be reported with hair loss. NOAA (pdf), 2014: The [Unusual Mortality Event] investigation will remain open and active for… ringed seals, ribbon seals, bearded seals and spotted seals… reports from the Bering Strait region continue regarding an unusual number… with patchy to generalized hair loss and/or… sores. Some of these “hairless seals” may represent survivors of the 2011 mortality event… the exact cause of this disease is not currently known… we cannot give specificrecommendations on the safety of these animals for food or contact with people.